Following are terms and terminology specifically related to Chance	products. For more general glass terms, see www.GlassyEye.com. Aqualux : tradename for a textured range of slumped glassware dating to 1939 only. Bent glass : the industry term applied to any sheet or glass	formed through slumping. Carafe : a vessel commonly used to contain wine. Normally an open vessel without stopper. Comport/Compote : term used to define a cake plate	with plinth. Crestware : tourist-ware specifically pertaining to the city, town or place where it	derives. Normally contains an identifying	crest and sometimes a pictorial scene. Fazzoletto : Italian term for 'handkerchief' and used to describe vases of this shape. Flashed : clear glass with a thin film of coloured glass applied. Used by Chance for railway signal lenses and the Intaglio range of Fiestaware. Flute : the wavy edge found on some circular and	elliptical shaped plates and bowls. Frigger : orig. a term applied to a master glassblowers 'end-of-day' piece, but having	no functional purpose; an	ornament. Often	used	nowadays to	define any	end-of-day	item. Intaglio : the process of cutting through a thin 'flashed' colour to reveal the clear glass underneath. Mottoware : items produced for club, institution or commercial	purposes. Normally contains logo, motto, or legend, etc. 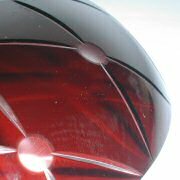 Obscure glass : textured glass made under the 'Antique' tradename. Used for privacy, such as bathrooms or as room dividers. Slumped : where the heated, semi-fluid glass 'slumps' into a mould to form the desired shape.